Funeral service for Jeraldene Lee Vaughn Eddy will be Sunday, March 3, 2019, at 2 p.m., at Cullman Heritage Funeral Home. Jackie Camp is officiating. Mrs. Eddy passed away Friday, March 1, at her residence. She was born March 28, 1936, to James Albert and Mary Lillie Vaughn. She was a bookkeeper at West Point School for 30 years, a member of Eastern Star Vinemont Chapter 534, and a past Grand Chaplain for the State of Alabama Grand Chapter. She was also a member of Liberty FCM Church where she had been a Sunday School teacher and children’s choir director, and was actively serving as the church choir director. 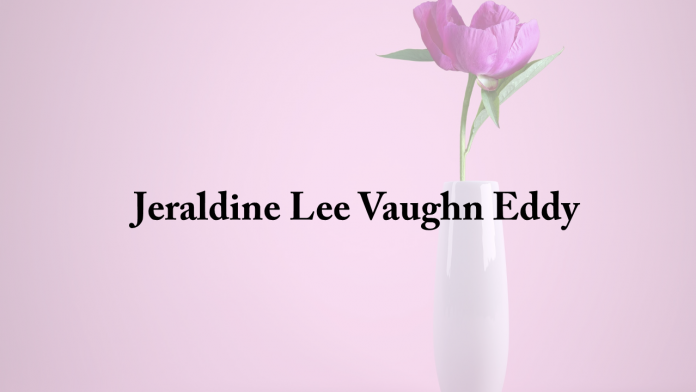 She was preceded in death by her parents; a son, Bradley Lee Eddy; and two sisters, Joie and Joyce Vaughn. Survivors include a daughter Lynn (Billy) Byrd; son Chuck (Lisa) Eddy; grandchildren, Jerri Ann Williams, Ben Satur, Charles Eddy, Rei Sterling, and Nathan Eddy; five great-grandchildren; a brother, James Euclid Vaughn; Special Friends, Larry and Debbie Penn, Joel and Brenda Holiday, Tabitha Brown, and all of SouthernCare; and a host of nieces, nephews, family and friends. Visitation will be Saturday, March 2, 2019, from 6:00-8:00 p.m. at Cullman Heritage Funeral Home. In lieu of flowers, the family requests donations be made to the American Heart Association or SouthernCare.